In 2014–15, new environmental infrastructure allowed water to be provided to the Mulcra Island floodplain, giving life to severely stressed lignum (spiny shrubland) communities. The Living Murray program is one of Australia's most significant long-term river restoration programs.It aims to achieve a healthy working River Murray system for all Australians by delivering environmental water to over 37,000 hectares of forests, wetlands and lakes along the River. Four sites in Victoria have been identified as 'icon sites' for restoration. These sites include Hattah Lakes, Gunbower Forest and Barmah Forest and Lindsay-Wallpolla Islands (including Mulcra Island). 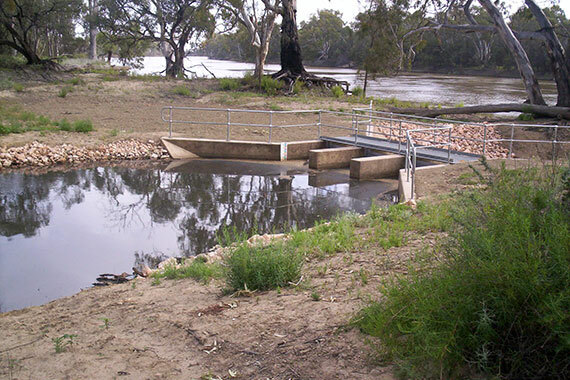 The infrastructure at Lindsay and Mulcra islands aims to extend water flows into the upper reaches of the anabranches, improving fish passage and connectivity between the anabranches and the Murray River. Monitoring suggests vegetation has improved in watered areas although parts of the system are still stressed - lignum and black box in some areas were in very poor condition. Over 6,200 ML of environmental water was delivered to Mulcra Island in spring and early summer 2014. The delivery helped to restore connectivity between the river and floodplain habitats and provided water to the severely stressed lignum communities on higher ground. Native and non-native fish were recorded moving through the new infrastructure on upper Potterwalkagee Creek, part of the Mulcra Island system. Wallpolla Island's Horseshoe Lagoon received 400 ML of environmental water in late autumn 2015. The delivery aimed to support the growth of aquatic plants and fringing vegetation. "Mulcra and Wallpolla islands have really responded well to the watering events, with the infrastructure at Mulcra Island making it possible to return flows to Potterwalkagee Creek in an efficient and effective way," Mallee Catchment Management Authority chair, Sharyon Peart, said. Anecdotal feedback from the community indicates environmental watering at Mulcra and Wallpolla islands also provided great conditions for kayaking.